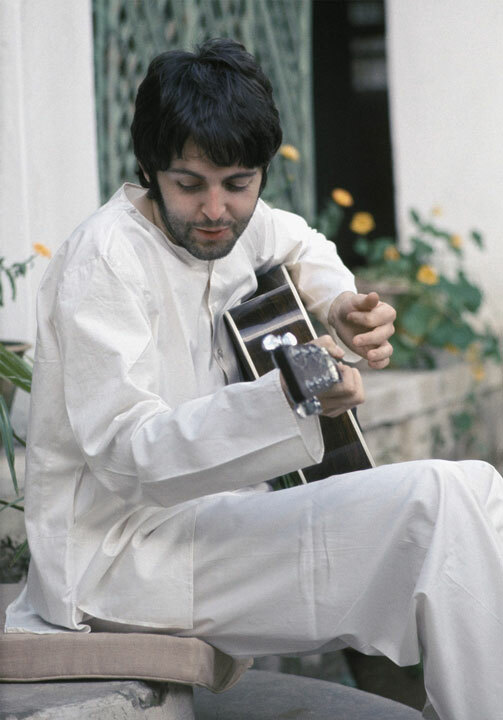 A couple of days later, late in the afternoon, I heard guitars and the sound of Paul’s and John’s voices. They were sitting with Ringo among the potted plants on the steps of their bungalow. I got my camera and after taking a few pictures through the chain link fence, opened the gate and joined them. They were strumming their Martin D-28 acoustic guitars, singing fragments of songs, musically meandering through some of my favorites: Michelle, All You Need Is Love, Norwegian Wood, Eleanor Rigby and others. John chuckled with pleasure at his new folk-guitar picking technique he said Donovan had been teaching him. Some time later Ringo mentioned dinner was ready but as John got up, Paul started to sing and play Ob-La-Di again. John couldn’t resist and fell in with him, playing and singing very upbeat. Then Ringo joined in, finger-snapping the rhythms. By then the sun had dropped behind the hills. A gentle aroma of evening jasmine drifted over the grounds, a peacock shrilled off in the woods, and after a while we all headed off to eat.